Published: Oct. 14, 2018 at 02:25 p.m.
Indianapolis Colts quarterback Andrew Luck's pass goes right through the hands of wide receiver Ryan Grant and is picked off by New York Jets linebacker Avery Williamson. 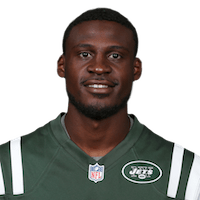 Published: Oct. 14, 2018 at 01:21 p.m.
New York Jets cornerback Morris Claiborne takes an interception 17-yards to put the Jets on the board. Published: Sept. 10, 2018 at 07:54 p.m.
New York Jets corner back Morris Claiborne intercepts Detroit Lions quarterback Matthew Stafford's pass by cutting off his route. Published: Oct. 8, 2017 at 03:23 p.m.